Are you willing to fight and die in a war because a crazy person manipulated the war by using staged false flag terror? Do you want your son, daughter or other loved ones to go off to war for a manipulated crazy Zionist agenda? There are Zionist propagandists embeded in governments around the world including the United States that want war, murder and destruction. Both WW1 and WW2 were manipulated wars. The Zionists caused both of these wars and now we are on the verge of WW3. The mainstream media is controlled by Zionists and they want you programmed to support their insanity and their war lust. American Mass Media is controlled by Zionists! What If Everything You Thought You Knew About WW2, Hitler And The Holocaust Was A Propaganda Lie? How do you start a fight when your opponent doesn’t want a fight with you? You force it… you create fear… you create fear and sell another stinkin’ pile of lies til the body count meets your project goals. In an interview with US talk show host Charlie Rose, former acting director of the US Central Intelligence Agency, Michael Morell openly conspired to “covertly” kill Russians and Iranians in Syria. In an attempt to justify what is essentially a conspiracy to commit acts of murder, terrorism and war, Morell would compare the plan to alleged covert operations waged against the US during its illegal invasion and occupation of Iraq in 2003 and onward. The difference between the US invasion of Iraq and that of Russia’s intervention in Syria, however, is significant. The US invaded Iraq in 2003, predicated upon a premeditated lie, while Russia was invited to aid the acting government of Syria. This was followed by the goy shill for Jew wars, Mike Morell, former acting director of the CIA, while endorsing Clinton, saying the US should kill Russians and Iranians in Syria. “They’re Washington establishment people. Look at the terrible job they’ve done. Look at the mess we’re in. Whether it’s the Middle East or anywhere else. I hadn’t planned on using any of them. “If our country got along with Russia, that would be a great thing. Oh, Donald! The Jews don’t wanna hear that! Russia is Jewry’s number one enemy, don’t you know that? Putin purged the Rothschild money changers long ago and no Jew has real power in Russia’s resurrection of “Symphony of Church and State” where Jews are deep-sixed. That’s why their lies, “Putin kills journalists who oppose him;” “Putin invaded Crimea;” “Putin sent troops to East Ukraine;” ad infinutum, are plastered all over the Jew-owned press. Now the mustard’s on the matzah ball. 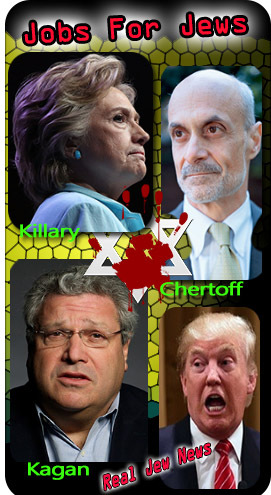 A new Jew think tank, (Project for a New American Century on steroids), “Center for a New American Security,” sketched out a road map for war that Hillary can roam freely through. Bombing Assad, then Iran, on to bigger fish to fry by baiting China and Russia, puts Hillary on Jewry’s silk road to hell. Yet, in spite of their plans, dear diary, I’m not too depressed about it. The future belongs to Russia not Jewmerica. At the end of the First World War, Germany was essentially tricked [see Paul Johnson A History of the Modern World (1983) p24 and H Nicholson Peacemaking 1919 (1933) pp13-16] into paying massive reparations to France and other economic competitors and former belligerent countries in terms of the so-called Treaty of Versailles, thanks to the liberal American President Woodrow Wilson. Germany was declared to be solely responsible for the war, in spite of the fact that ‘Germany did not plot a European war, did not want one, and made genuine efforts, though too belated, to avert one.’ (Professor Sydney B Fay The Origins of the World War (vol. 2 p 552)). As a result of these massive enforced financial reparations, by 1923 the situation in Germany became desperate and inflation on an astronomical scale became the only way out for the government. Printing presses were engaged to print money around the clock. In 1921 the exchange rate was 75 marks to the dollar. By 1924 this had become about 5 trillion marks to the dollar. This virtually destroyed the German middle class (Koestler The God that Failed p 28), reducing any bank savings to a virtual zero. Tough stuff, Sir Arthur! What made you get out of the wrong side of the bed? Strangely enough, in a book unexpectedly published by Princeton University Press in 1984, Sarah Gordon (Hitler, Germans and the “Jewish Question”) essentially confirms what Bryant says. According to her, ‘Jews were never a large percentage of the total German population; at no time did they exceed 1% of the population during the years 1871-1933.’ But she adds ‘Jews were overrepresented in business, commerce, and public and private service.. They were especially visible in private banking in Berlin, which in 1923 had 150 private Jewish banks, as opposed to only 11 private non-Jewish banks.. They owned 41% of iron and scrap iron firms and 57% of other metal businesses.. Jews were very active in the stock market, particularly in Berlin, where in 1928 they comprised 80% of the leading members of the stock exchange. By 1933, when the Nazis began eliminating Jews from prominent positions, 85% of the brokers on the Berlin Stock exchange were dismissed because of their “race”.. At least a quarter of full professors and instructors (at German universities) had Jewish origins.. In 1905-6 Jewish students comprised 25% of the law and medical students.. In 1931, 50% of the 234 theatre directors in Germany were Jewish, and in Berlin the number was 80%.. In 1929 it was estimated that the per capita income of Jews in Berlin was twice that of other Berlin residents..’ etc etc. Arthur Koestler confirms the Jewish over-involvement in German publishing. ‘Ullstein’s was a kind of super-trust; the largest organization of its kind in Europe, and probably In the world. They published four daily papers in Berlin alone, among these the venerable Vossische Zeitung, founded in the eighteenth century, and the B.Z. am Mittag, an evening paper.. Apart from these, Ullstein’s published more than a dozen weekly and monthly periodicals, ran their own news service, their own travel agency, etc., and were one of the leading book publishers. The firm was owned by the brothers Ullstein – they were five, like the original Rothschild brothers, and like them also, they were Jews.’ (The God that Failed (1950) ed. RHS Crossman, p 31). Mowrer says ‘No one who lived through the period from 1919 to 1926 is likely to forget the sexual promiscuity that prevailed.. Throughout a town like Berlin, hotels and pensions made vast fortunes by letting rooms by the hour or day to baggageless, unregistered guests. Hundreds of cabarets, pleasure resorts and the like served for purposes of getting acquainted and acquiring the proper mood..’ (pp. 153-4). Bryant describes throngs of child prostitutes outside the doors of the great Berlin hotels and restaurants. He adds ‘Most of them (the night clubs and vice-resorts) were owned and managed by Jews. And it was the Jews.. among the promoters of this trade who were remembered in after years.’ (pp. 144-5). Douglas Reed, Chief Central European correspondent before WWII for the London Times, was profoundly anti-German and anti-Hitler. But nevertheless he reported: ‘I watched the Brown Shirts going from shop to shop with paint pots and daubing on the window panes the word “Jew”, in dripping red letters. The Kurfrstendamm was to me a revelation. I knew that Jews were prominent in business life, but I did not know that they almost monopolized important branches of it. Germany had one Jew to one hundred gentiles, said the statistics; but the fashionable Kurfrstendamm, according to the dripping red legends, had about one gentile shop to ninety-nine Jewish ones.’ (Reed Insanity Fair (1938) p. 152-3). In Reed’s book Disgrace Abounding of the following year he notes ‘In the Berlin (of pre-Hitler years) most of the theatres were Jewish-owned or Jewish-leased, most of the leading film and stage actors were Jews, the plays performed were often by German, Austrian or Hungarian Jews and were staged by Jewish film producers, applauded by Jewish dramatic critics in Jewish newspapers.. The Jews are not cleverer than the Gentiles, if by clever you mean good at their jobs. They ruthlessly exploit the common feeling of Jews, first to get a foothold in a particular trade or calling, then to squeeze the non-Jews out of it.. It is not true that Jews are better journalists than Gentiles. They held all the posts on those Berlin papers because the proprietors and editors were Jewish’ (pp238-9). The Jewish writer Edwin Black notes ‘For example, in Berlin alone, about 75% of the attorneys and nearly as many of the doctors were Jewish.’ (Black, The Transfer Agreement (1984) p58. To cap it all, Jews were perceived as dangerous enemies of Germany after Samuel Untermeyer, the leader of the World Jewish Economic Federation, declared war on Germany on August 6 1933. (Edwin Black The Transfer Agreement: the Untold Story of the Secret Pact between the Third Reich and Palestine (1984) pp272-277) According to Black, ‘The one man who most embodied the potential death blow to Germany was Samuel Untermeyer.’ (p 369). This was the culmination of a worldwide boycott of German goods led by international Jewish organizations. The London Daily Express on March 24, 1933 carried the headline Judea Declares War on Germany. The boycott was particularly motivated by the German imposition of the Nuremberg Laws, which ironically were similar in intent and content to the Jewish cultural exclusivism practiced so visibly in present-day Israel (Hannah Arendt Eichmann in Jerusalem p 7). Joseph P. Kennedy, U.S. Ambassador to Britain during the years immediately preceding WW2 was the father of the famous American Kennedy dynasty. James Forrestal the first US Secretary of Defense (1947-1949) quotes him as saying “Chamberlain (the British Prime Minister) stated that America and the world Jews had forced England into the war”. (The Forrestal Diaries ed. Millis, Cassell 1952 p129). Hugh Wilson, the American Ambassador in Berlin until 1938, the year before the war broke out, found anti-Semitism in Germany ‘understandable’. This was because before the advent of the Nazis, “the stage, the press, medicine and law [were] crowded with Jewsamong the few with money to splurge, a high proportion [were] Jewsthe leaders of the Bolshevist movement in Russia, a movement desperately feared in Germany, were Jews. One could feel the spreading resentment and hatred.” (Hugh Wilson: Diplomat between the Wars, Longmans 1941, quoted in Leonard Mosley, Lindbergh, Hodder 1976). Sir Nevile Henderson, British Ambassador in Berlin ‘said further that the hostile attitude in Great Britain was the work of Jews and enemies of the Nazis, which was what Hitler thought himself’ (Taylor, AJP: The Origins of the Second World War Penguin 1965, 1987 etc p 324). Hitler wanted to destroy Communism, a fact that earned him the immense hatred and animosity of the Jewish organisations and the media and politicians of the west which they could influence. After all, according to the Jewish writer Chaim Bermant, although Jews formed less than five percent of Russia’s population, they formed more than fifty percent of its revolutionaries. ‘It must be added that most of the leading revolutionaries who convulsed Europe in the final decades of the last century and the first decades of this one, stemmed from prosperous Jewish families.. They were perhaps typified by the father of revolution, Karl Marx.. Thus when, after the chaos of World War I, revolutions broke out all over Europe, Jews were everywhere at the helm; Trotsky, Sverdlov, Kamenev and Zinoviev in Russia, Bela Kun in Hungary, Kurt Eisner in Bavaria, and, most improbable of all, Rosa Luxemburg in Berlin. (Bermant The Jews (1977), chapter 8. “He (Hitler) then astonished us by speaking with admiration of the British Empire, of the necessity for its existence, and of the civilisation that Britain had brought into the world. He remarked, with a shrug of the shoulders, that the creation of its Empire had been achieved by means that were often harsh, but ‘where there is planing, there are shavings flying’. He compared the British Empire with the catholic Church – saying they were both essential elements of stability in the world. He said that all he wanted from Britain was that she should acknowledge Germany’s position on the Continent. The return of Germany’s colonies would be desirable but not essential, and he would even offer to support Britain with troops if she should be involved in difficulties anywhere..” (p 200). According to Liddell Hart, “At the time we believed that the repulse of the Luftwaffe in the ‘Battle over Britain’ had saved her. That is only part of the explanation, the last part of it. The original cause, which goes much deeper, is that Hitler did not want to conquer England. He took little interest in the invasion preparations, and for weeks did nothing tospur them on; then, after a brief impulse to invade, he veered around again and suspended the preparations. He was preparing, instead, to invade Russia” (p140). This gives a completely different complexion, not only to the war, but to the successful suppression of this information during the war and afterwards. Historians today know only too well where the boundaries lie within which they can paint their pictures of the war and its aftermath, and the consequences of venturing beyond those boundaries, irrespective of the evidence. Unfortunately, only too few of them have been prepared to have the courage to break out of this dreadful straitjacket of official and unofficial censorship.